Even before the whole Dieselgate scandal broke, Volkswagen was leaving me feeling uninspired. Their recent designs have been so conservative. As much as their luxury brand Audi is exciting both inside and out, many Volkswagen vehicles are too bland for me. In emoji speak, they’d be the face with the straight line for the mouth. However, my tester this week helped bring a renewed smile to my face, and changed me from feeling ho hum to happy. 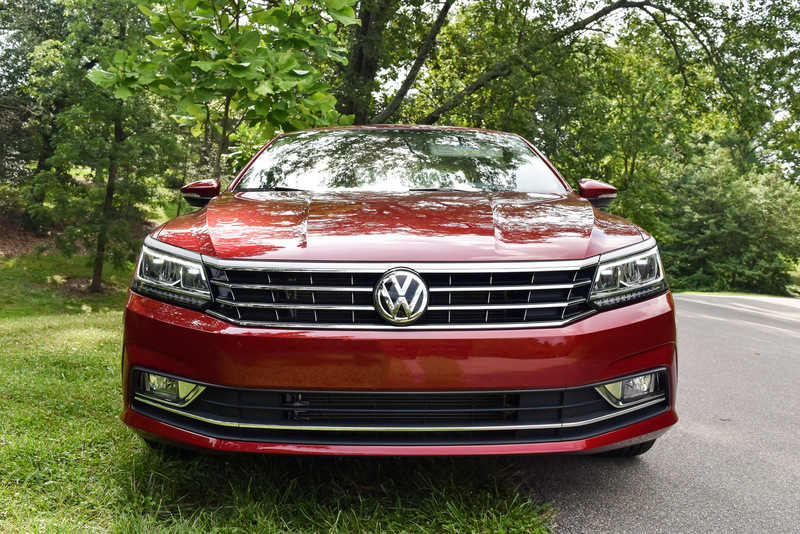 The 2016 Volkswagen Passat is now the second straight VW that has impressed me (the previous one being the amazing, fun-to-drive Golf). The midsize Passat doesn’t get many drastic updates or changes to this model year. But since 2014, the last model year I was in, the Passat just looks more impressive. 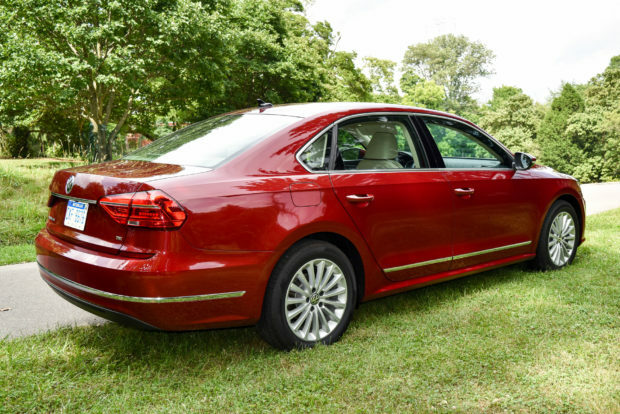 For this model year, the Passat now has LED lights and chrome accents around the window. The grille is also more stylized. Don’t misunderstand me, the Passat still has a very conservative exterior design, it’s just less boring than before. Small indentations on the hood provide a sleek frontward appearance, as does the sporty grille. 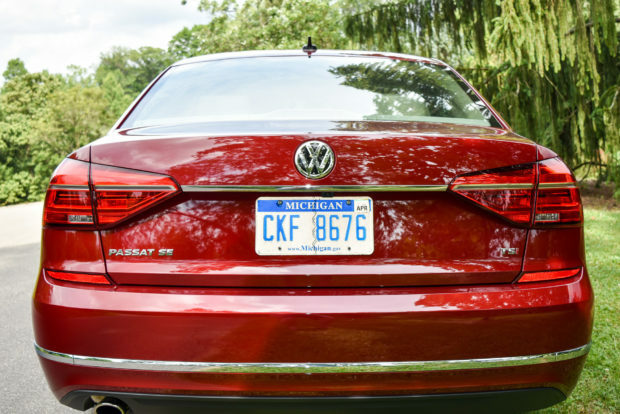 In profile, the Passat loses most of its excitement. There’s little styling on the side panels, and the back is almost as dull. If not for the redesigned LED taillights, there’d be little character at all for the rear of the Passat. There are two starkly different options for power in the 2016 Passat. A small, 1.8-liter turbocharged 4-cylinder engine is rated at 170 horsepower and a 3.6-liter V6 carries over from the previous model year, making 280 horsepower. My tester was the peppy 1.8-liter with the turbo. My love affair with small turbos continues with this exhilarating engine. Similar to how the Golf with the turbo really over performed its output numbers, so too does the Passat. Maybe it’s the Audi inspiration or the German engineering, but the 1.8-liter turbo really is fun to drive. The only drawback is the somewhat out of date six-speed automatic transmission which does not seem to be capable of keeping up with the turbo. There’s no noticeable turbo lag during certain RPMs, but at times it seems to lag behind, and shifts are pretty noticeable. Off the line, the Passat gets going and allows for quick merges into traffic. At highway speed, the Passat is more than capable. There is some engine noise that permeates the cabin. Steering is responsive and seems more track-tuned than you might expect. Reading further about the Passat’s steering, I learned it has electro-mechanical speed-sensitive steering. What that means to us non-engineers is that the handling is superb and the steering will be controlled and effective, no matter the driving situation. The interior of the Passat is, without a doubt, the most impressive aspect of this midsize sedan. For a car with a price tag under $30,000, you won’t find a nicer interior. The leatherette seats are comfortable with a great angle for driving. Both front and rear seats are heated too. The steering wheel and shift knob are wrapped in leather. Volkswagen calls the interior of my tester Cornsilk Beige with Brown Piping. This color scheme is elegant, timeless and downright snazzy. The faux wood trim on the door panels and dashboard coordinates perfectly with the brown piping around the seats. The panoramic sunroof is outstanding, and the center stack is clean and well organized. The back seat is downright spacious. Two adults can fit comfortably back there, and have enough head room. The legroom is ample. A child could even fit between the two adults comfortably without eating into their shoulder room. For a midsize sedan, the Passat feels more like a full size with its interior space. Case in point, the trunk space boasts an impressive 15.9 cubic feet of space. With 60/40 folding options in the back seat, you can further expand cargo area. The Passat truly is a great commuter and starter executive car. The vibe it has inside teeters on luxury and certainly has all the space a family could want in a sedan. A huge improvement comes in the infotainment system. This is an area Audi is spectacular at, but that Volkswagen has been disappointing at in the past. However, with a quicker, more responsive infotainment and touchscreen, the Passat is a lot more intuitive. The 6.3-inch touchscreen is somewhat small, leading to some fumbling and mishits on the home screen, but otherwise, this system is better than the previous generation one (by far). Thankfully, VW also got rid of the annoying MDI converter plug for smart phones and went with a USB port this time around (hello!!!) The Passat is also equipped with Apple CarPlay and Android Audio. The eight-speaker sound system offers high quality. On fuel economy, the Passat is leader within the segment. It has an EPA rating of 25 mpg/city and 38 mpg/highway. In a week’s worth of mostly suburban driving (off the highway), I averaged 32 mpg. Considering all the trouble VW has had with the EPA and fuel economy regarding their TDI diesels, this sort of outstanding mileage for a gas engine should win over some jaded consumers. As impressed as I was with the Passat, it’s even more impressive knowing that I didn’t even drive the top-of-the-line trim. The Passat comes in seven trims, which is too many. That many trims can bewilder and confuse consumers. My tester was the SE with the Technology Package. The SE trim is where the nicer touch points and the soft leatherette seats start. Add in the Technology Package, which includes a hands-free trunk, blind spot monitoring and lane departure warning and it’s a special-feeling car for under $30,000. My tester came with a special lighting package which included upgrades to LED headlights and the daytime running lights. This is a somewhat costly upgrade at $1,095. 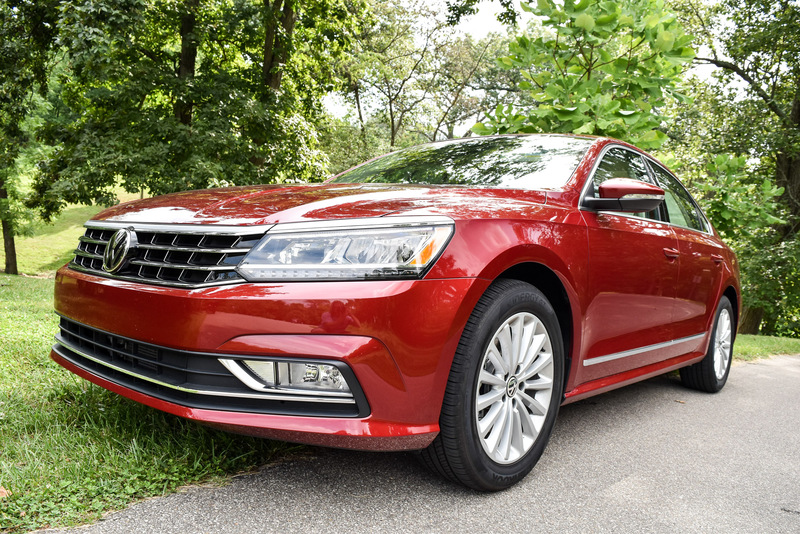 Stick with the SE with Technology for a base price of $28,410 and you will be impressed with how nice the Passat feels and how enjoyable it is to drive. Despite some of the negative headlines and publicity they’ve received, Volkswagen continues to make cars that will resonate with what’s important to the American consumer. Their conservative styling won’t detract from their vehicles, as long as they continue to offer spacious, luxurious interiors like the one found in the Passat. To do all that with good fuel economy and an affordable price – good times and good things are ahead for Volkswagen.